The CV06 Mini is currently out of production! The CV06 Mini is a scaled down version of the larger Clearvue Cyclones designed to be powered by a shop vacuum. All the component parts of the CV06 can be obtained separately, although this is often the most expensive option. It does however mean that should you damage any part it is replaceable. 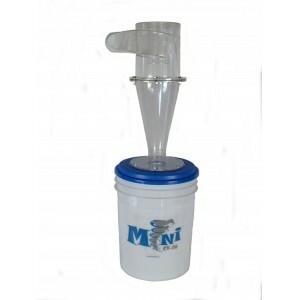 The Australian and New Zealand CV06 Mini is supplied as a standard unit that includes, the cyclone body and cone assembly, the dust collection bucket, the wheeled mounting plate, the connecting hose and all the hardware to put it together. There is even a strap that is included to enable you to attach the CV06 to you shop vac for ultimate convenience. The CV06 Mini is designed for situations where you wish to use a shop vac but protect that vac from the fine dust that so easily clogs filters and lowers efficiency. Most frequent users of shop vacs complain that they have to replace filters or collection bags much too frequently. Often the filter in the shop vac is so inefficient that the motor has a very short life. The price for current stock of CV06 minis in standard configuration is $ 299.00 This includes $ 27.18 of GST. This price does not include the cost of freight from our warehouse to your location. We will obtain an exact transport cost once we have your details, alternatively, we can organise to make units available for collection to save on this cost.